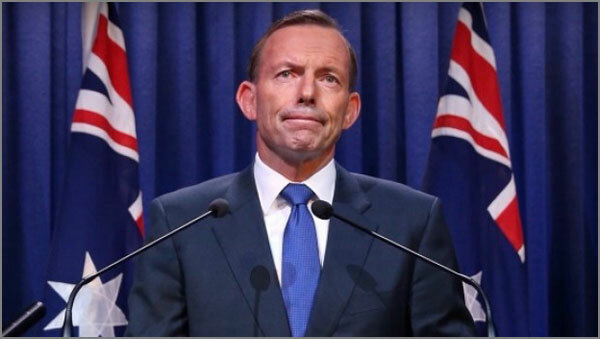 Last month PM Tony Abbott gave a special news conference about possible terror attacks against Australia. Flanked by eight national flags he used the word “threat” 16 times, “death cult”, “safe” and “secure” seven times, and “protect” five times. He took no questions. Justifying the restriction of rights by fear: PM Abbott. The government is ramping up public fears about terrorism to justify introducing legislation restricting Australians’ right to be a citizen and to be considered innocent until proven guilty. Abbott has suggested that protecting the community will require weakening of individual rights. The government is deliberately whipping up a climate of fear, then posing as the people’s defender, to undermine civil rights and gain access to metadata information about every Australian, while maintaining its grasp on power. Abbott has argued that Man Haron Monis, perpetrator of the Lindt café siege, had mistakenly been given “the benefit of the doubt”, and that people who “might be a threat to our country” should be denied welfare, Medicare and other social security payments. The denial of rights and entitlements to people who might engage in terrorist activities, even though they haven’t actually done so, opens the door for political victimisation. Abbott also proposed that people suspected of intending to travel overseas to engage in unauthorised armed conflict would have their passports cancelled. Australians with dual citizenship who managed to slip the net and engage in conflict would be stripped of their Australian citizenship. The policy would force them back to their country of origin. Those who had fled persecution there could face a death sentence. Those who fought but only had Australian citizenship would formally remain citizens but would be banned from returning, and would lose their rights for consular assistance. Despite the government claims, they would in effect be rendered stateless because they would be unable to return home. The ban on overseas travel also reverses the onus of proof. The accused would have to prove they had a legitimate reason for visiting a particular country before they could leave. Abbott also wants to “take action against hate preachers” like members of the Islamist fundamentalist group Hizb Ut-Tahir, who have never been found guilty of terrorist offences. But the government is still defending the right to be a bigot. So presumably anyone can be a bigot, unless they’re Muslim. There is no legal definition of “hate preachers” just as there is no substance to back Abbott’s terror preaching. The government claims telecommunications now play an essential role in terrorist recruitment, and it wants telecommunication companies to retain customer metadata which would be available to law enforcement agencies without a warrant. Metadata is data recorded electronically from telecommunications equipment, other than the content of the calls and messages. It includes the number, duration and location from which a phone call is made, email addresses, the logs, status, aliases or identifiers of on-line chat rooms and the start and finish times of internet sessions. It does not include email attachments or web camera transmissions. Nor does it include information about which websites an internet user visits. That’s currently treated as content, although the Northern Territory and Victorian police have argued that it should be accessible. Metadata currently held by companies is available to state, territory and federal police, ASIO, the tax office and other organisations conducting criminal investigations. Under current law companies don’t have to retain metadata, hence the government’s plan to enforce them to do so. Law enforcement agencies requested metadata access 339,640 times in 2012- 2013. However, one request may involve information concerning many individuals, and the figure does not include the number of requests by ASIO. That’s secret. Some commentators have argued that legislation should specify the type of data retained. But the government doesn’t agree, because that could result in blockage of the legislation by opposition MPs concerned about invasion of privacy. It wants to be free to spy on anyone and essentially everyone. Access to metadata is loaded with privacy issues. Last July Queensland Police officials investigated police cadets’ metadata to find out whether they were sleeping with each other. Journalist Laurie Oakes had his metadata accessed by intelligence personnel seeking the identity of an informant. Metadata access will inevitably lead to retribution against whistleblowers and against jounalists. In 2012 Victoria’s Privacy Commissioner described data retention as “characteristic of a police state” and “premised on the assumption that all citizens should be monitored”. Abbott claimed ASIO currently has 400 counter terrorism investigations underway, but ISIS is not currently posing a direct threat to Australia, nor even to the US, as US Homeland Security Secretary Joh Johnson admitted recently. Moreover, Abbott consistently makes reference to “Islamic terrorists”. He implied that Monis’ religion contributed to making him a terrorist, even though he was clearly a highly troubled individual with a history of mental illness and a criminal record. That insult was heightened by Abbott’s remark that he wished more Muslim leaders would publicly embrace peace as part of their religion, and “mean it”. The implication is that they don’t, and that’s a gross libel of the Muslim community. The irony is that the public animosity created by Abbott’s finger-pointing could actually foster conditions for terrorist recruitment. The government’s attempt to link terrorists with the internet in order to justify the metadata legislation is also spurious. A British report on terrorist recruitment reveals that the internet still plays a relatively minor role, with personal contact the main influence. One company has estimated that retaining metadata would cost $400 million and add $10 per month to the average subscriber’s bill. The government has indicated a willingness to pay half the cost, despite its claims about the nation’s disastrous financial condition. Would the situation change if Abbott was dumped as Liberal leader? Several years ago Malcolm Turnbull described a Labor government proposal for data retention as “… the latest effort by the Gillard government to restrain freedom of speech.” But as Communications Minister he has fully supported the present move to gain metadata access. The Australian people must remove the odious coalition from power, root and branch.